Prince Alphonso, eldest son of Edward I, was to marry Margaret, daughter of Florent V, Count of Holland, in 1284, but he died before the wedding. This psalter is thought to have been commissioned by Edward I for his son's marriage because of the heraldry painted at the beginning of Psalm 1. The decoration was left unfinished until the early 14th century, when it was filled out in various styles. The conspicuous first letter of Psalm 51 was decorated in the early 14th century. Its ornament based on leaf forms is inhabited by a fantastic human-headed monster while another animated human head peers into the margin. Embossed punches maximize the glitter of plentiful gold leaf. Besides being luxurious, all this serves to mark one of the divisions of the psalter. To organise the cycle of prayer that monks and devout lay people recited on a daily basis, the psalter was divided into eight sections: seven for the prayers said very early in the morning (matins) and one for evening prayers (vespers). 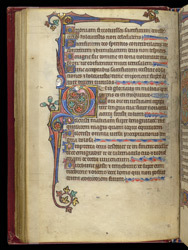 The Alphonso Psalter would have been used as a personal prayerbook. Around the time it was made, the first books of hours, special prayerbooks for the laity, were being created based on the ones used by monks.